Posted October 2, 2018 by Reed & Associates & filed under Press Releases. 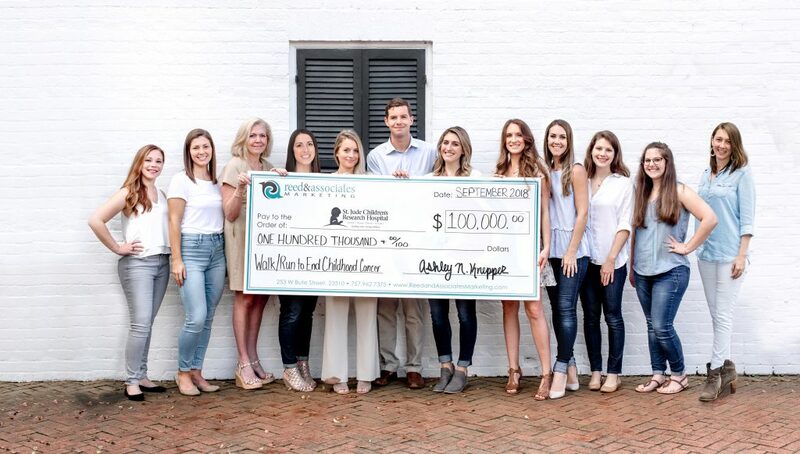 Norfolk, Va. – Reed & Associates Marketing (R&A) just completed its seventh year of fundraising for the St. Jude Children’s Research Hospital and its annual Walk/Run to End Childhood Cancer. Having led the way in Hampton Roads for multiple years, it is no surprise that R&A was the flagship sponsor, committing to raise $15,000 this year. R&A was even able to exceed that goal, raising a total of $19,917. What is most impressive is R&A’s dedication and consistency that has allowed them to reach a new milestone, breaking the $100,000 mark in total funds raised and donated to St. Jude since 2012. These are numbers you might expect from a large cooperation, not a small team of 15. The R&A team credits Knepper for her leadership and commitment to giving back; and especially, her compassion for the patients and families of St. Jude. “She certainly leads the team by example and is always willing to generate a company match, offer incentives, and even take the highest fundraising team members down to Memphis, TN on an all-expenses-paid trip to witness the work of St. Jude first-hand”, states R&A’s Content & Brand Manager, Kaitlyn Parker. St. Jude Children’s Research Hospital is leading the way the world understands, treats and defeats childhood cancer and other life-threatening diseases. Each year, supporters nationwide join together in the St. Jude Walk/Run to End Childhood Cancer. This family-friendly walk/run helps raise funds to support the lifesaving mission of the hospital, where no family ever receives a bill for treatment, travel, housing or food. It commences in September, Childhood Cancer Awareness Month, with local events happening across the country and right here in Hampton Roads. Although the St. Jude Children’s Research Hospital is one of R&A’s primary philanthropic endeavors, the company also visits the Foodbank of Southeastern Virginia and The Eastern Shore once a quarter, volunteering their time and bringing a car-load of personal hygiene items to pass out to the community. Additionally, R&A has donated time, resource, and financial support to organizations like Crush Cancer, VOLUNTEER Hampton Roads, The Virginia Gentlemen Foundation, The King’s Daughters, Girls on the Run, and many others. “We believe the ability to give back is only limited by desire, not the size of the organization or the financial means available. Leading with that mindset has presented R&A the opportunity to work alongside and on behalf of many inspiring individuals and organizations,” says Knepper. If you know of a non-profit organization that would be interested in partnering with R&A, you can get in touch on their website.